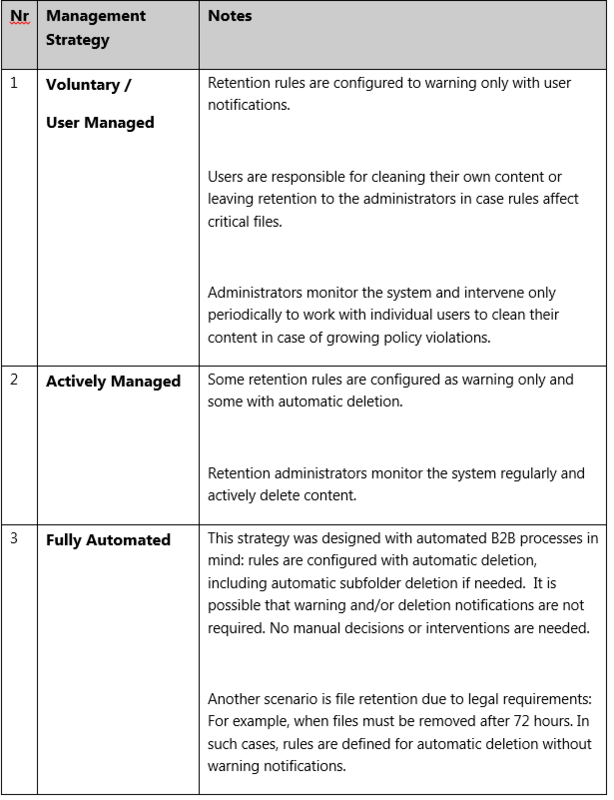 Retention policy services give administrators and retention users tools to manage content expiration. According to a predefined set of retention rules, the Thru server can be configured to provide retention warning alerts (in the web interface and Thru explorer), send email notifications, and perform content deletion. In order to scale with very large sites, retention services were designed with fine grained configuration options at rule level allowing administrators to control the amount of notifications they receive. To use the Retention Feature of your Thru site, click Retention in the Administrators view. Before going over the design, consider the following options for retention management. One or more strategies can be used together in the same site as needed.